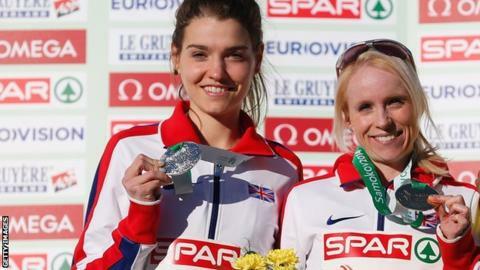 Kate Avery says if someone had offered her a silver medal before the European Cross Country Championships on Sunday, she "would have bitten their hand off". The 23-year-old from Newton Aycliffe was in a sprint finish with team-mate Gemma Steel. In November, Avery became the first British woman to win the United States Collegiate Cross Country title. "I thought I could make top 10. Second is amazing but it's hard to take when you almost win," she told BBC Sport. "Winning would have been unbelievable but if someone had offered me second on the start line I would have bitten their hand off." Avery earlier this year and ended up finishing fourth in the 10,000m in Glasgow. She was then selected for the European Cross Country on the basis of her form running for Iona College in America. "I was excited to be given the chance to race having not done the trial, and thought I was capable of making the top 10," she added. "But, having not raced any of the girls recently, it was really hard to know. The conditions were pretty awful but I felt good and just went for it."